Zentangle Challenge #219 was all about making a tile using only straight lines. It's done with "Paradox" which is one of my favourite patterns. I might find the time to do another tile somewhere along this week or the next. Till' then, happy tangling to all of you. 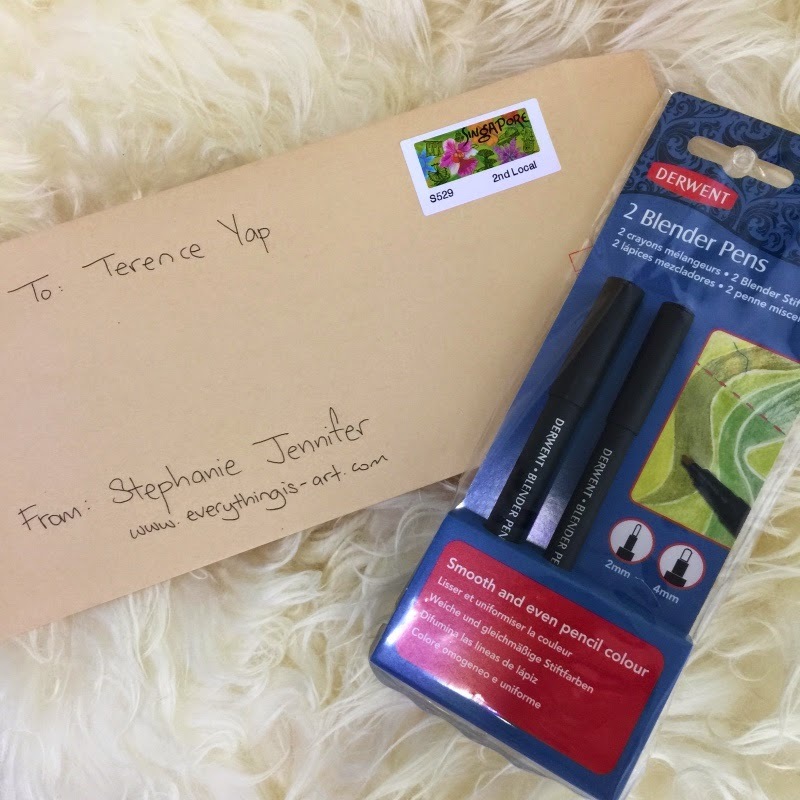 I loved the blender pens so much that for my April 2015 Giveaway, I chose them as the giveaway prize. It then occurred to me that I never showed a before and after photo of me using the blender pens... So without further ado, allow me to show you why I feel that these pens are magic and that every coloured pencil artist should have a set. As you can see, the colours on the bird look rich and properly blended whereas the shades of brown on the tree stump look speckled and the colour of the paper is showing through. Let's use the Derwent blender pens on the tree stump, shall we? Voila! The speckling is almost completely gone. I did not add any other layers of coloured pencils from the previous picture. 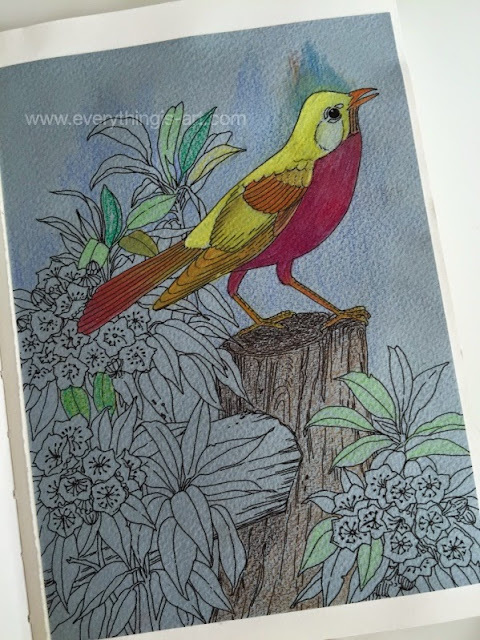 The more layers of coloured pencils you put on the paper before using the blender pen, the richer the colours will be. I feel that right now, the tones on the tree stump aren't saturated enough. But you know what? I can always go over it again and add more layers, then use the blender pen again after. 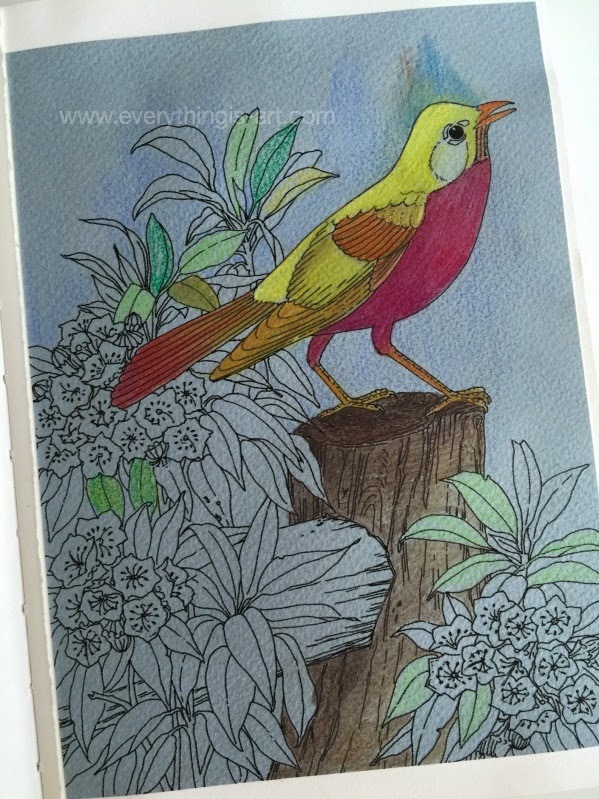 That's how I got the yellow on the bird to be able to fully cover the blue of the paper and still look so bright. 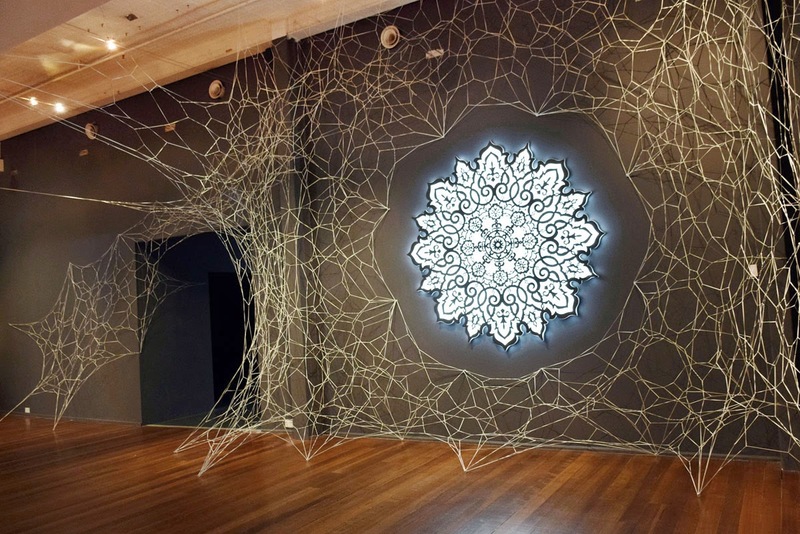 "Entanglement" is one of the works that was part of her exhibition, "Recrafted". 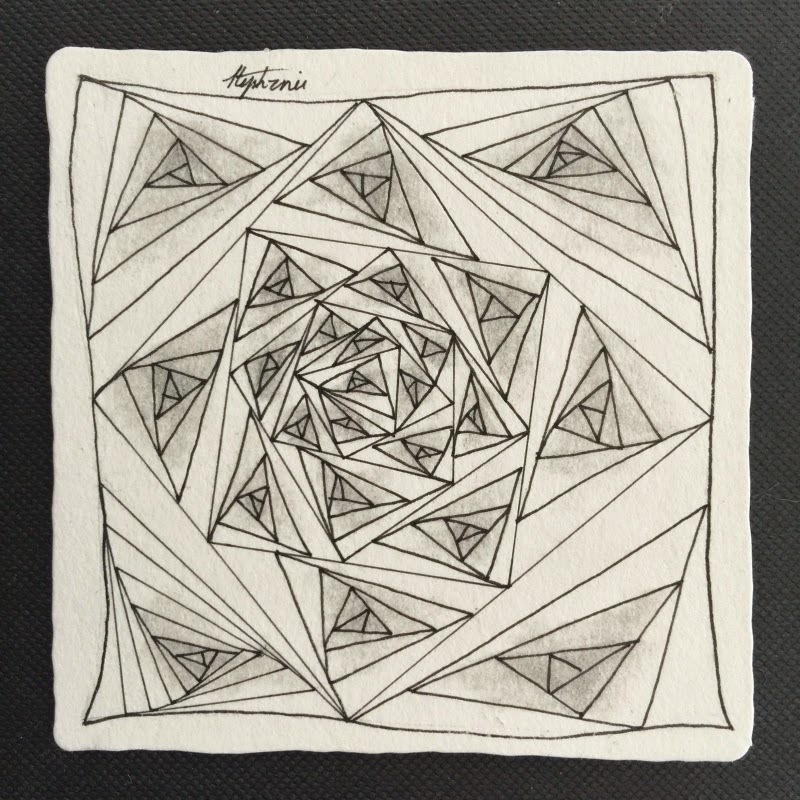 You can view the art works that were exhibited at Recrafted and all of NeSpoon's other works via her Behance. 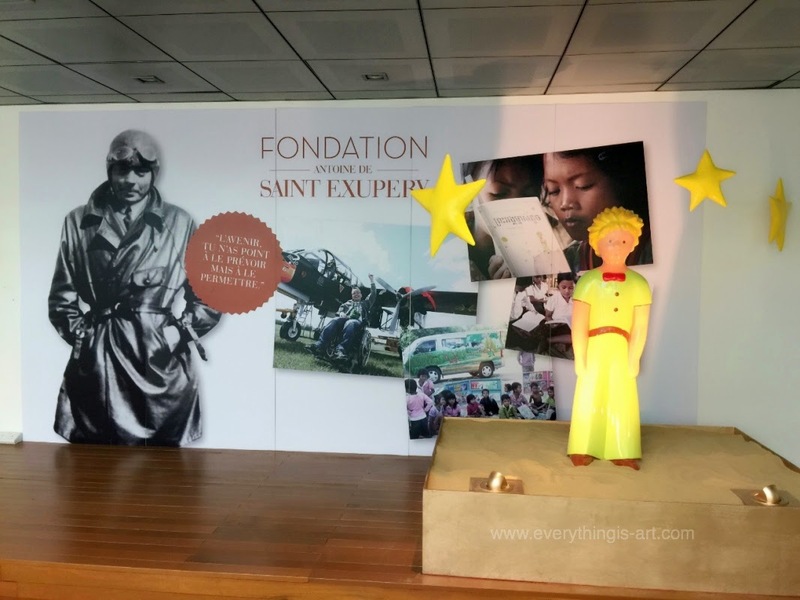 The exhibition is by Arnaud Nazare-Aga and the Antoine de Saint-Exupery Youth Foundation. 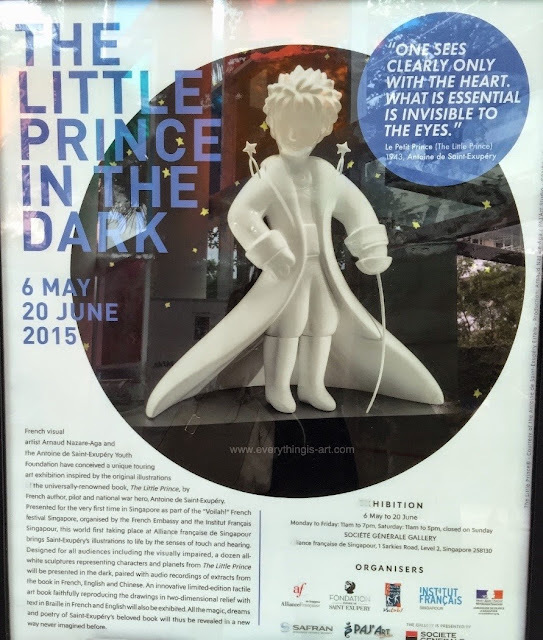 The exhibition pays homage to the ever-famous and beloved book, "The Little Prince". Arnaud faithfully recreates multiple white sculptures of various characters and planets from the book. 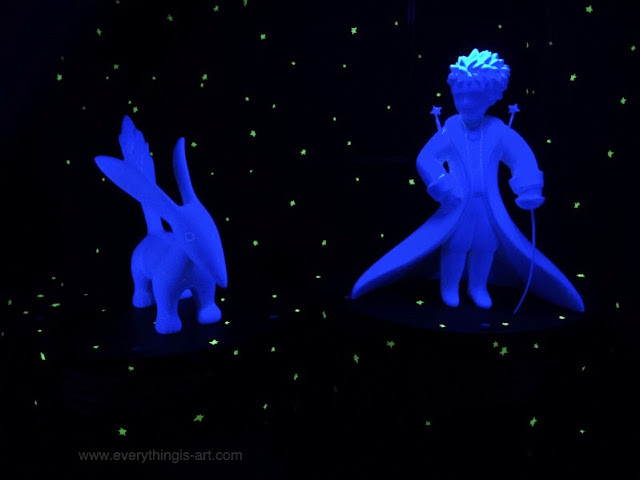 Those sculptures are exhibited in a dark room lit with black light, and audio readings of extracts from the book are added to complete the experience. A little poster regarding the exhibition displayed at the lobby. The exhibition space is on the second floor. Here's just one of the many sculptures exhibited in the hall. The blue hue of the sculptures are from the black lights illuminating the space. A sculpture of the Little Prince in a sandbox to recreate the scene where he meets the protagonist. "If you please– draw me a sheep." 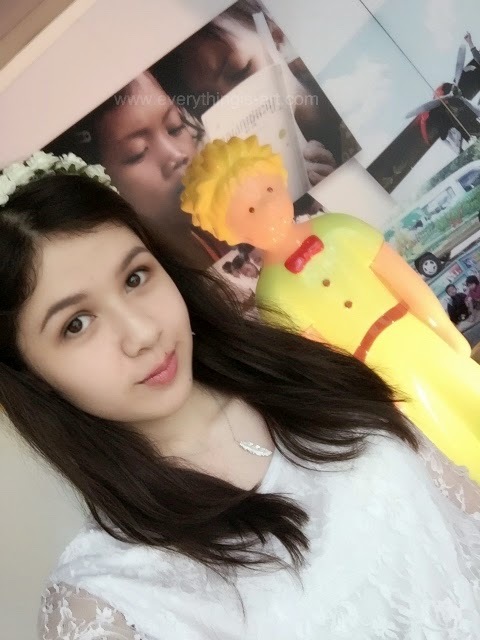 And here's a selfie of me and the Little Prince. The exhibition is a wonderful visual-audio experience. If you're as much of a fan of the book as I am, I highly recommend popping down to take a look. 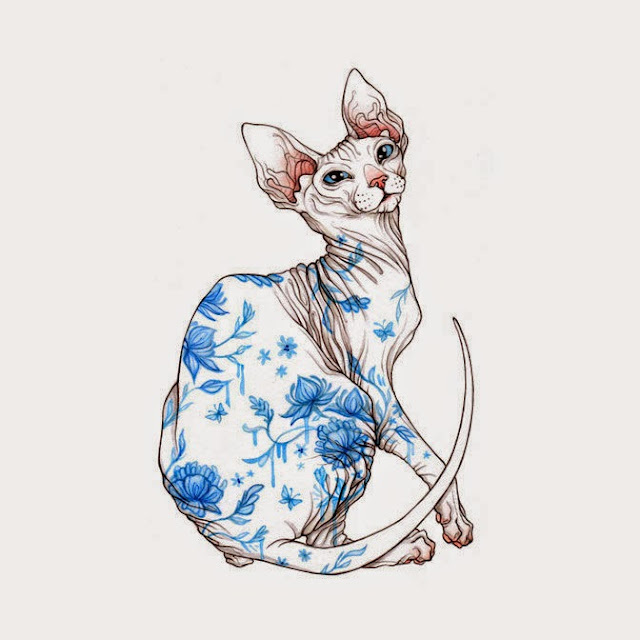 I'm a supporter of Threadless.com because they're a company that creates beautiful products while helping artists to earn. 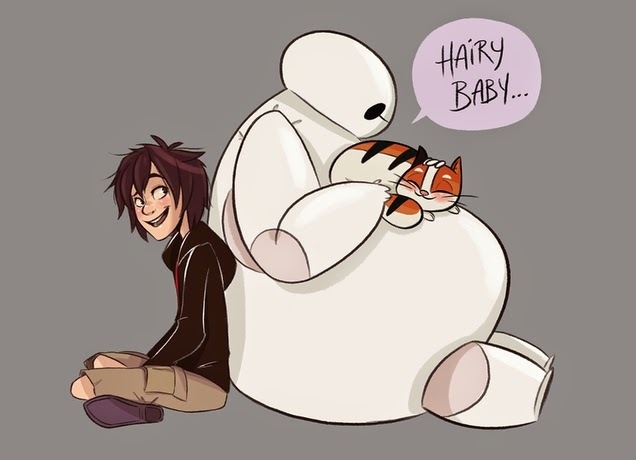 Threadless recently held a Big Hero 6 design competition, and recently, they announced their winner. Samantha is also known as “Violet1202″. She's 22 years old, is a Singaporean, and recently graduated from Lasalle College of The Arts with a diploma in Animation Art. Threadless did an interview on her and how she felt about winning the competition. She's super sweet and you should definitely read the interview via this link. 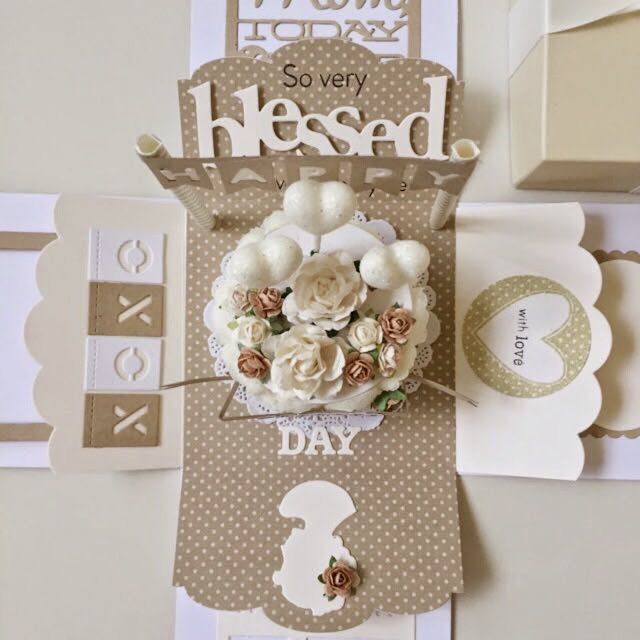 You can also visit her website via this link. I'm sure you're familiar with Kit Kats.. We all know there's the regular milk chocolate flavoured ones. I also know that some places do sell the dark chocolate variety, which I love love love. 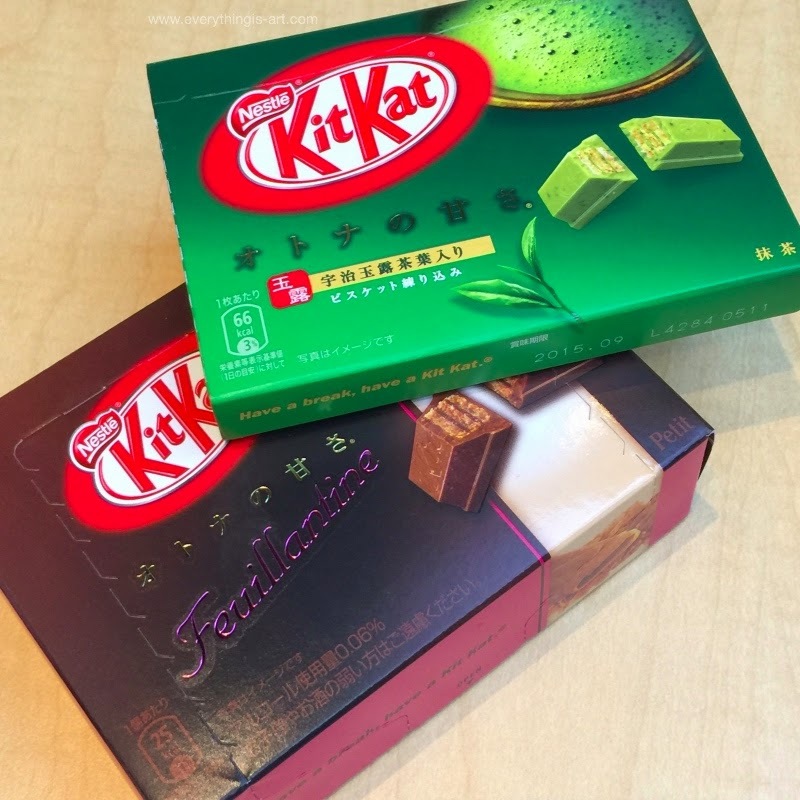 And then, recently, green tea (or, as some people call it, Matcha) Kit Kats have become popular... But today, I found rum flavoured ones! Apparently, they're called "Feuillanline" and are made with crispy cocoa crepe and rum powder. The other one is green tea with chocolate filling. 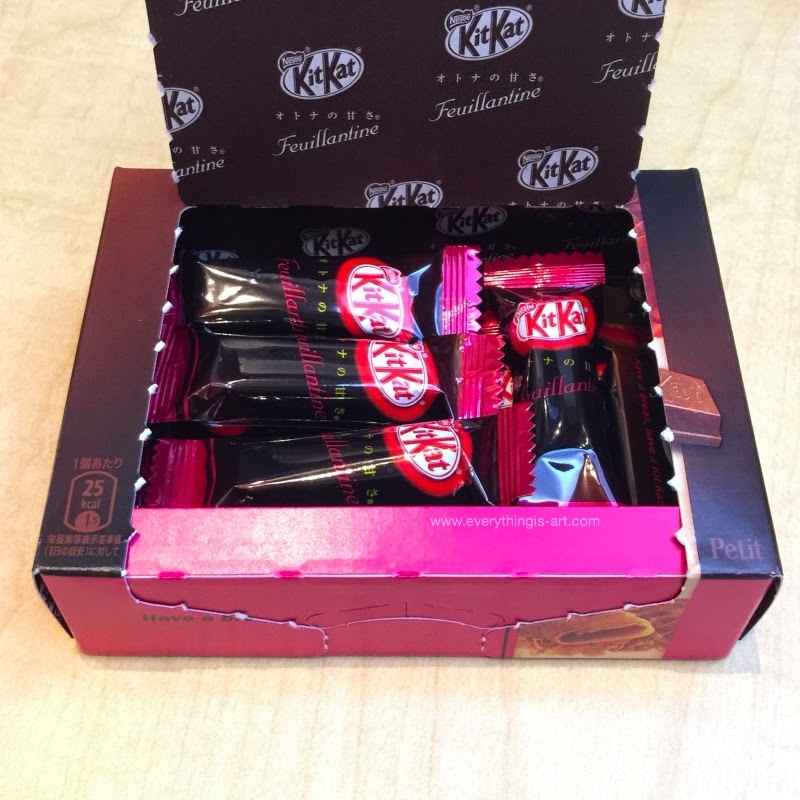 The individual kit kats are bite-sized and the box can be closed by its tab. I loved the flavour of this kit kat. It was on the sweeter side, but then you could taste a hint of the rum just as you finished the kit kat. I'd rate it 9 out of 10 stars. 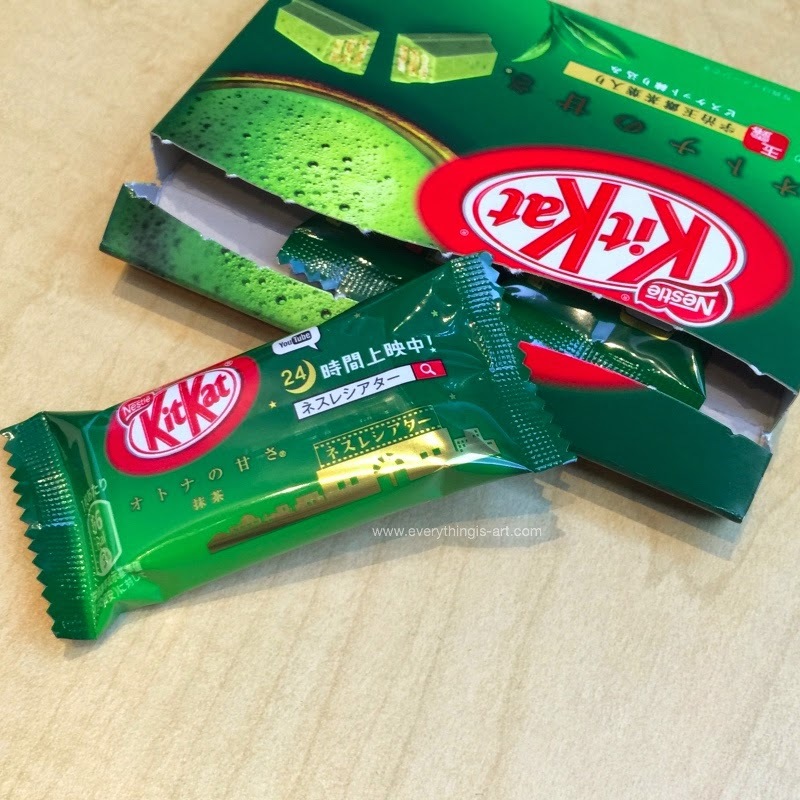 Matcha kit kats. 3 in one box, with each packet containing two sticks of kit kats just like how the regular kit kat is like. Only these ones are smaller than your regular kit kats. 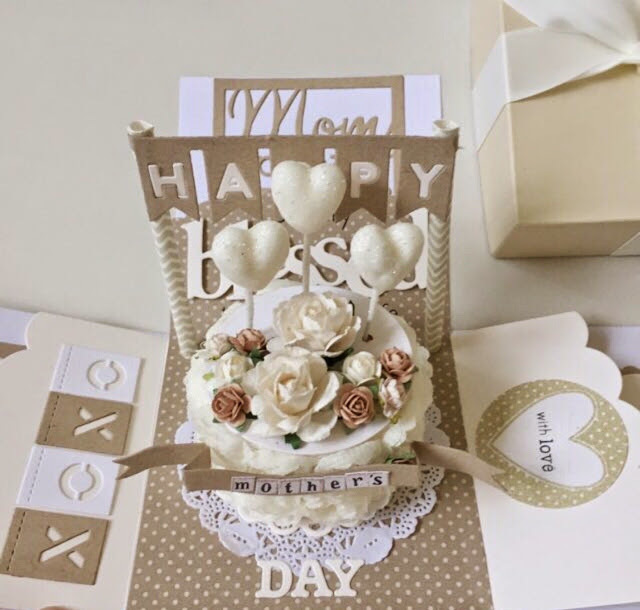 The cute thing about this one was that there was a little space on the box for you to write a message to someone and give it to them. 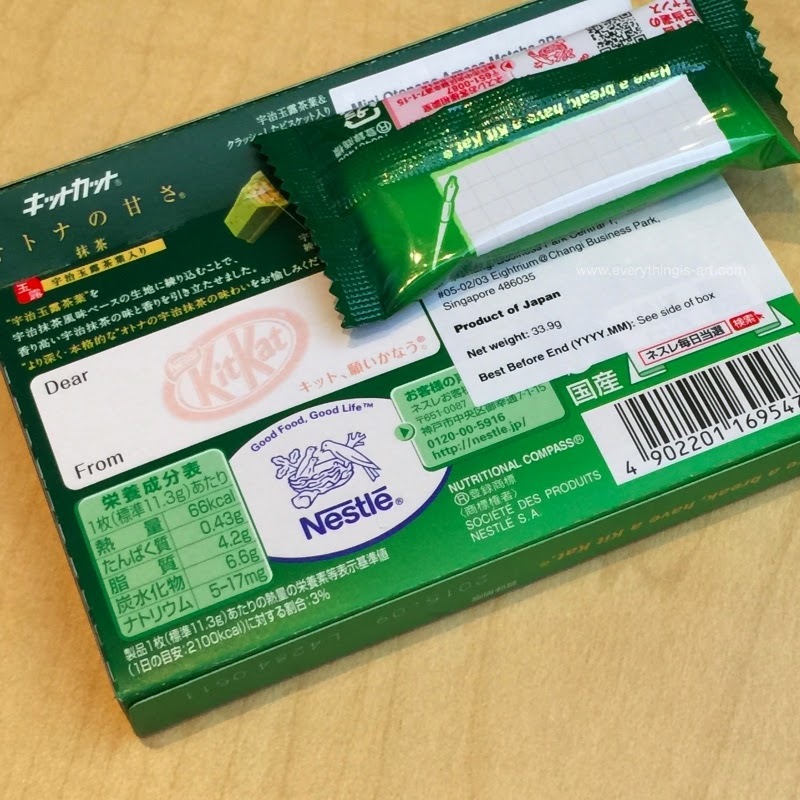 Each little kit kat also had a little white box too. So cute! I'm not a fan of green tea, so I have a biased opinion and thus will not rate it. The kit kat really does taste like mocha powder and it wasn't too sweet at all. Best of all, you can get your own ones too! I found these at the NTUC Fairprice located at Simei, so do check whether the NTUC located near you stocks them too. The green tea ones cost me $2.55, while the rum ones cost me $4.15. Congratulations, Terence Yap! You won yourself a set of Derwent blender pens. I've already sent out the gift and it should reach you in a couple of days. To the rest of you who took part and didn't win, I still read all of your messages. 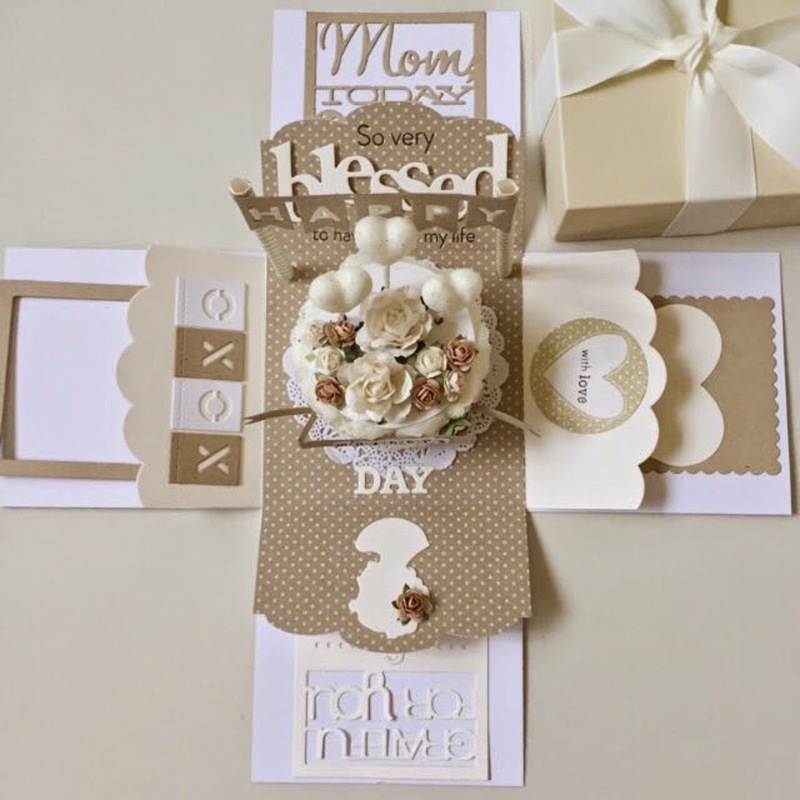 I really appreciate you supporting my artistic journey... 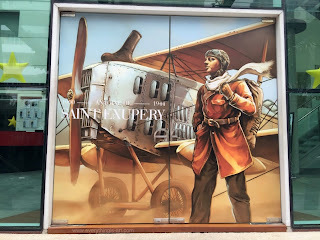 I blog to keep myself inspired, to show you what awesome new art products and books are in the market, the Art events that happen in Singapore, and the new things I learn along the way. I wonder what I'll be giving away next time.... You'll just have to stick around to find out! 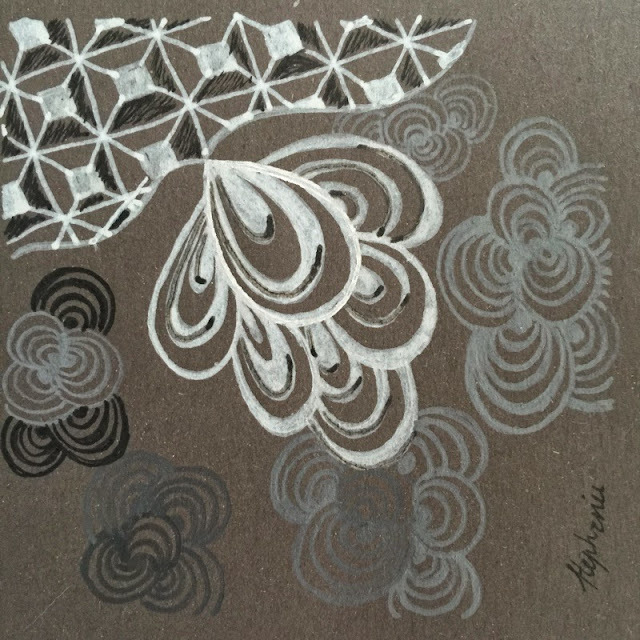 Zentangle Challenge #216 called for using the tangle "Brella". 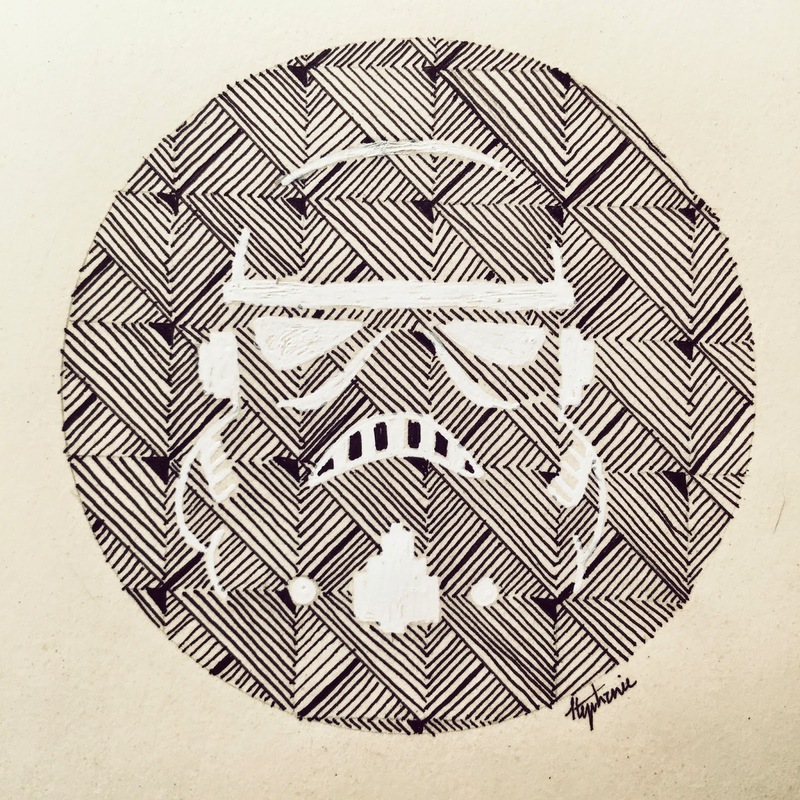 As it was also the 4th of May, there was an additional challenge to pay homage to Star Wars. 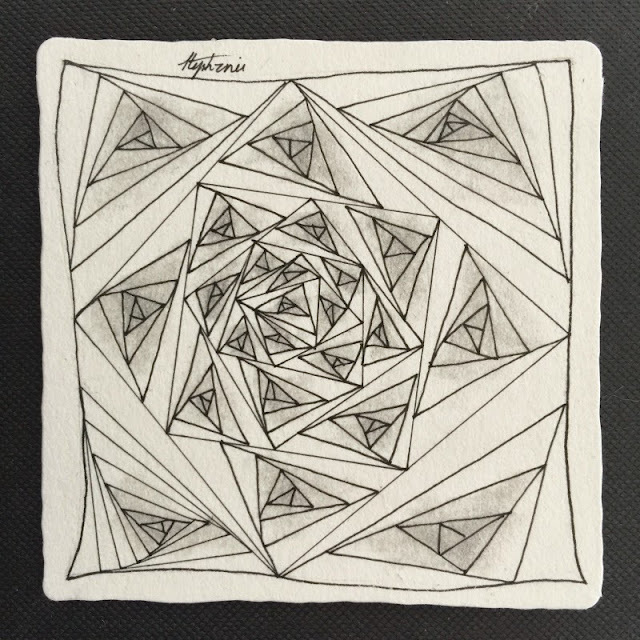 The drawing was the size of a zentangle tile, but I drew it in my Enviro Journal. 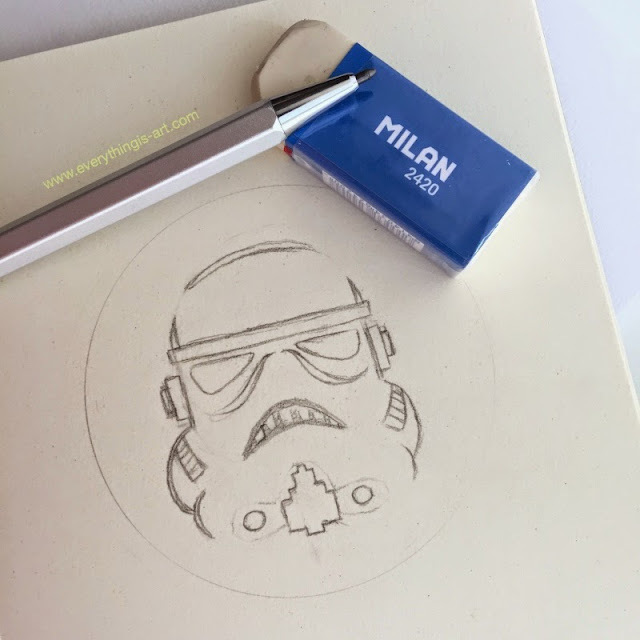 Also, the Milan eraser you see in the photo is absolutely lovely to use and I plan to write a review about all the different Milan erasers you can find at Art Friend. I know it's not the 4th anymore... But I did post it earlier on my Instagram. For those of you who aren't following me on Instagram, you can find me over there at "havepen_willdraw". 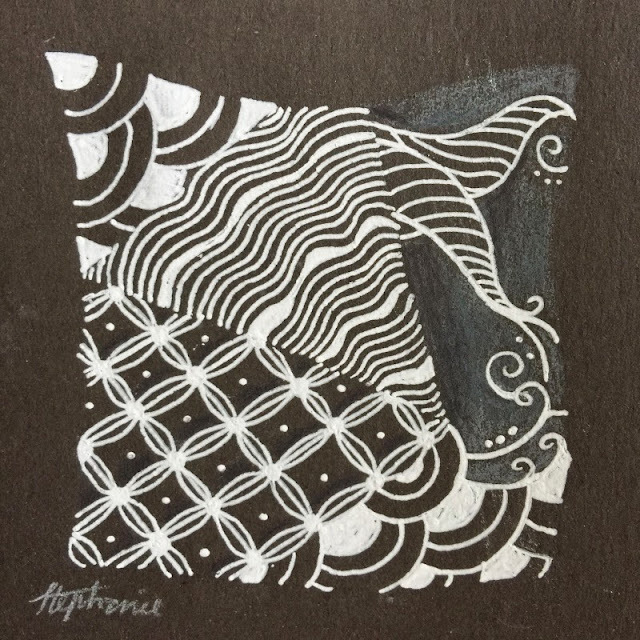 To see the next Zentangle Challenge submission that I made ( click this link ). A hot air balloon floating under water... A lightbulb octopus... A man meeting a unicorn... Those are some of the works Ted Chin creates. 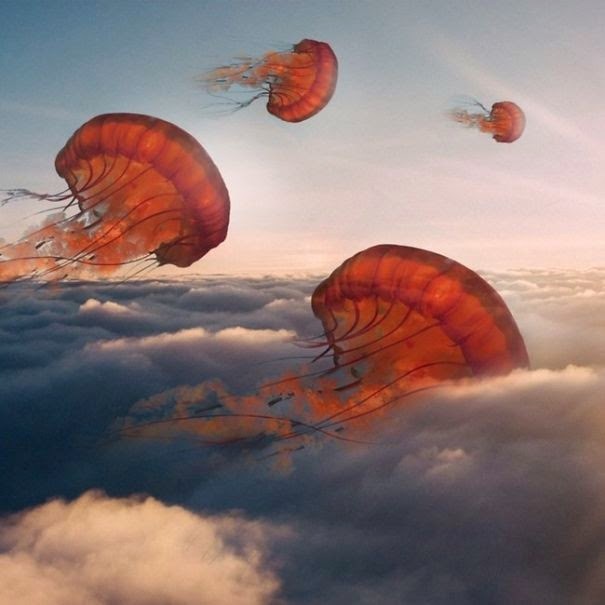 The art work above depicts beautiful jellyfishes floating through the sky. The warm light of the rising sun penetrating them and giving them a wonderful internal glow. I've always loved jellyfishes, partially due to the fact that I'm naturally drawn to water and partially due to how beautiful they look as they move with the motion of the ocean. Ted Chin portrayed that movement perfectly. You can view more of his works via his Instagram. In "Red Dot", the dots were easy to find. In "Blue 2", the twos were slightly harder to find. In "600 Black Spots" the spots were in plain sight, just difficult to keep count of. In this book, will the yellow square be easy to find, or not? This book delighted the kids I teach all the same. The younger kids seemed to prefer this one as compared to "Red Dot". How about you? Which book in David Carter's series do you like best?